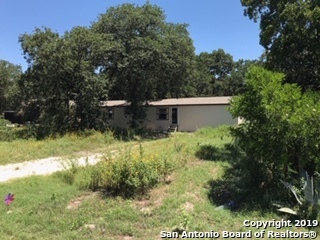 All Elmendorf homes currently listed for sale in Elmendorf as of 04/22/2019 are shown below. You can change the search criteria at any time by pressing the 'Change Search' button below. If you have any questions or you would like more information about any Elmendorf homes for sale or other Elmendorf real estate, please contact us and one of our knowledgeable Elmendorf REALTORS® would be pleased to assist you. "Location, Location. 21.35 Acres on the corner of Loop 1604 and Schultz Road; located 4 miles from I-37 and 4 miles from 181. Commercial Potential, Convenient location to locate a business & residence. A 1963 Sqft. Brick home with 3 Bedrooms/ 2 Baths, Remodeled kitchen, Metal Carport, Lots of base and gravel. 40x100 4 Bay Shop. Approx. 15 Acres of Field. This property is Multi-use Commercial/Residential. No City Taxes. Close to Halliburton, Weatherford, and Rail park. Close to Braunig and Calaver"
"A MUST SEE!!! **No Restrictions**No City Tax**10 Acres w/Ag Exemption**Mineral Rights** Prime Location**Business/Residential**Bring Your Business**Divide & Resale. Adorable 1488 sqft house w/3 bedrooms/2 baths. NEW roof (2017), NEW A/C (2018), NEW water heater (2013), NEW septic tank (2017), NEW flooring (2017), NEW windows & siding (2017), 300 ft well w/NEW pressure pump & tank (2015), NEW 250 gallon propane tank (2017). Buyer is responsible for any roll back taxes from changes in use. 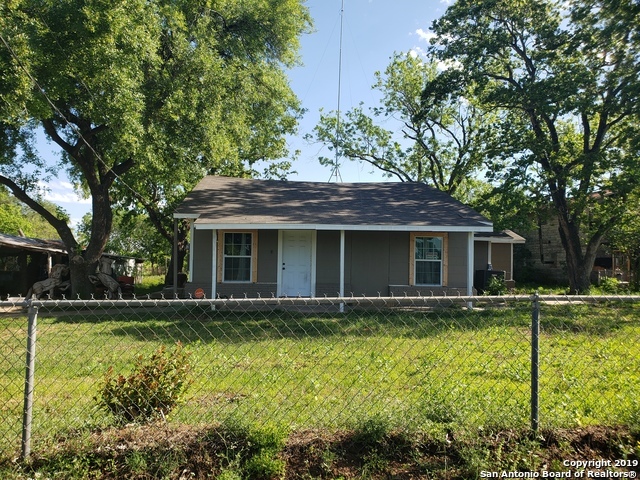 See list "
"BEAUTIFUL HOME JUST COMPLETELY REHABBED FEATURING GRANITE COUNTERS, TILED BACK SPLASH, NEW PLANK TILED FLOORS & CARPET, FRESH PAINT INSIDE AND OUT, NEW POOL PUMP & JUST REPAINTED. 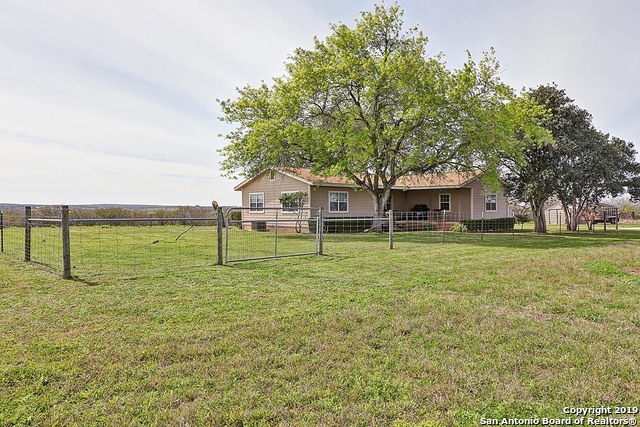 THIS IS A GREAT 3 BEDROOM- 2 1/2 BATH HOME ON OVER 3 FENCED ACRES. YOU WON'T FIND ANOTHER HOME IN THIS CONDITION ON 3 ACRES WITH AN IN GROUND POOL FOR THIS PRICE." "I can't tell you how many people want property like this in the area! A home offering 3/2/2 plus a separate Garage, a Barn for your hearts desire and acres; there is so much you can do here. On a frontage rd in Elmendorf, set back enough to enjoy the view to all sides. This 4.373 acres is a rare find with so many possibilities for you to make it into your country hearts desire (cows not included). Owner willing to finance also." 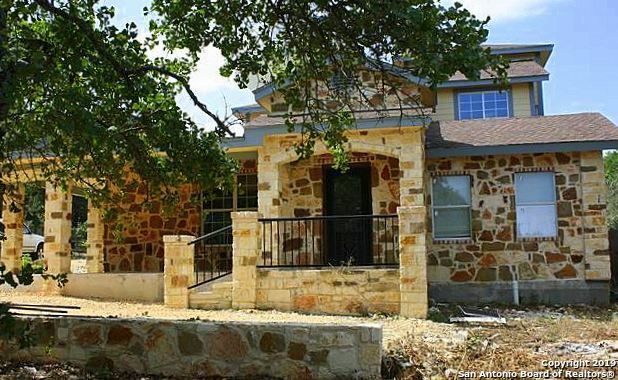 "Newly built custom home situated on just under 1/2 an acre. Open living floor plan consist of a spacious family room, formal dining & island kitchen (granite counters/custom cabinets) downstairs which blend effortlessly and make entertaining a piece of cake. Also found on the main level are the master retreat & 2 secondary bdrms. As an added bonus, the upstairs boast 2 bdrms, living space, full bath & room for a kitchenette. Covered wrap around porches. All located within minutes of city conveni"
"This one was placed on The lat. 3 months ago the buyer must move a great opportunity to get a brand new Palm Harbor custom home on over half and acre this property won't last long Owner will Do Owner Finance with Half Down"
"This property is now under auction terms. Seller has the right (a) to change the date, place, and terms of the sale; (b) to remove the property from the market, and (c) to sell the property prior to the sale. This property is being marketed sight unseen only. Please do not disturb occupants. See attachment for PAS requirements and WFHM offer submittal information in MLS document section. 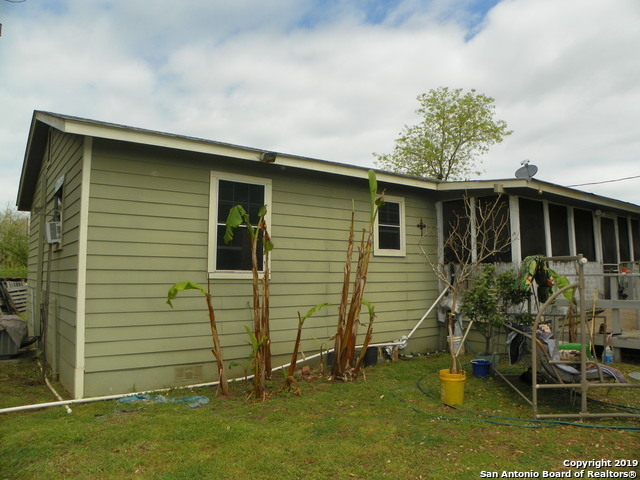 Seller will disclose title company once we reach a sales agreement." "This 4 bedroom 3 bath custom built 2 story home has dual master bedrooms located downstairs.2 bedrooms upstairs.Huge kitchen and breakfast area.Living room has 10 foot ceilings. Very big living room downstairs.Covered patio and decking for outdoor enjoyment.This is a wonderful project to finish just needs fixtures, paint and flooring.This home is livable but needs finishing touches. 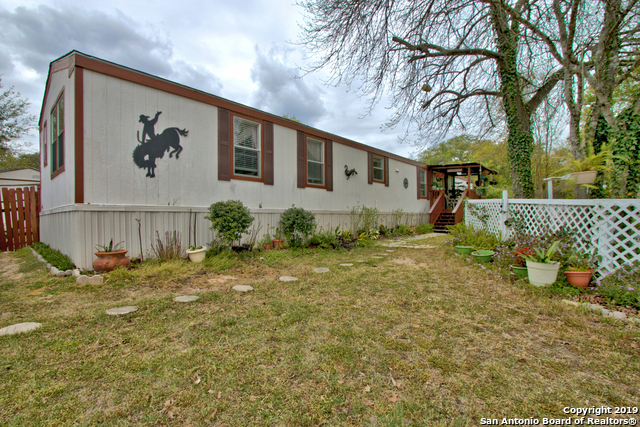 Located on 1/2 acre." 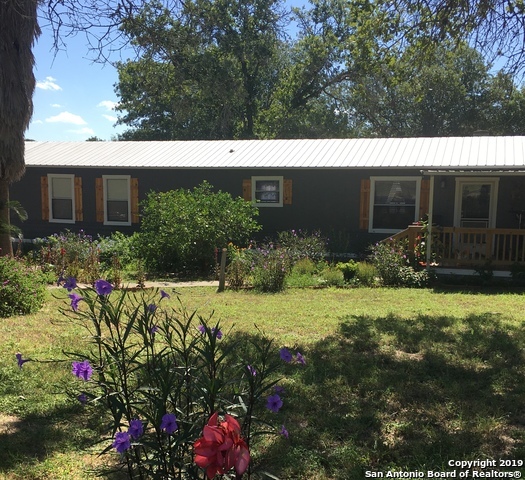 "Booming location just under an acre off Loop 1604 & Schultz Road, close to I-37 & 181. Convenient location for your residence & business with many companies moving in the area. At 1652 Sqft. w/ 3 Bedrooms/ 2 Baths, and about 90% renovated and ready for new buyer to finish out. No City Taxes. 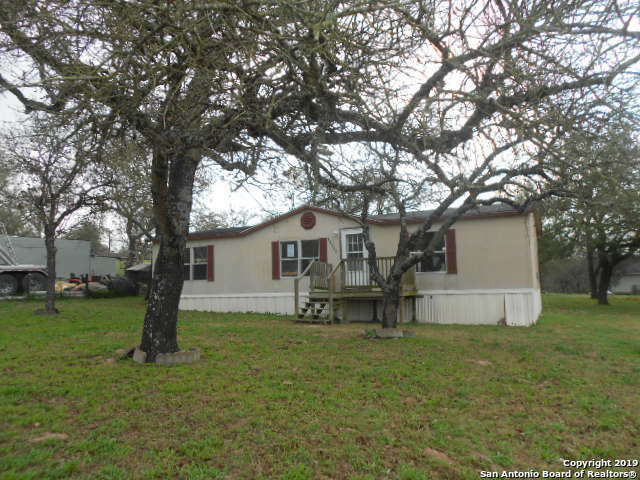 Close to Halliburton, Weatherford, Rail park, Braunig and Calaveras Lakes, and downtown." 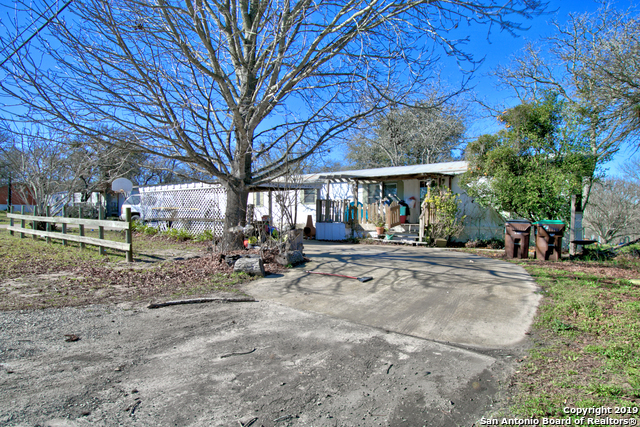 "Immaculate condition mobile home on almost 1/2 Acre lot with mature trees, only 3 yrs old! Spacious floor plan, beautiful kitchen with island seating open to the living room and dining area. You'll have plenty of room for the family with 3 bedrooms that ALL feature walk-in closets!! Park your cars under the 2 vehicle car port. 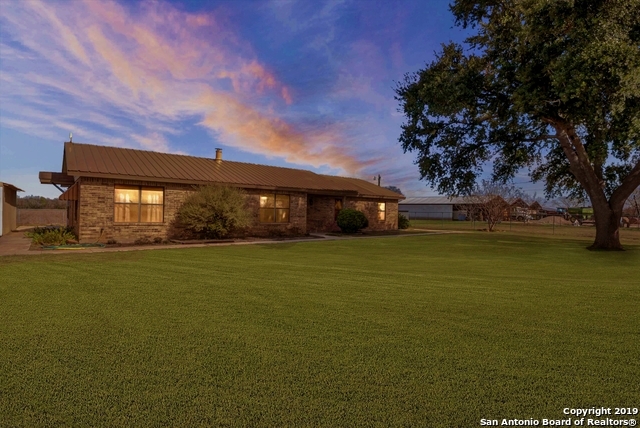 Easy access to highway, close to restaurants, and just a short drive from San Antonio. Don't miss out on this opportunity, call and schedule a showing!" "I am looking for a gentle homeowner to enjoy my 3 bedrooms and 1&1/2 Baths. I have a comfortable and efficient layout. My cozy living area combines with my breakfast bar and Eat-In-Kitchen. My beautiful costume countertop compliments my vinyl tile flooring. My master bedroom is a comfortable size; including my 1/2 master bath. My nice size lot is ideal for expanding. My yard is fenced and cross-fenced, lots of fruit trees; bananas, peach,pear, lemon & pecan...There is so much more to me...Come o"
"Absolute bargain. Priced Firm for your buyer who wants a crazy great deal on a super home. Don't miss this golden opportunity for a fantastic deal in a wonderful home on .55 of an acre. AS IS **Home recently appraised at $145,000. What a great deal!! Vengan a ver esta casa lista para su familia, buenas escuelas y area tranquila." "What a bargain! This home is move in ready and freshly painted. Spacious kitchen with cabinets, cabinets, and more cabinets! The fireplace provides a cozy atmosphere in the large living room. French doors in the dining area provide wonderful natural light. Come take a look!" "Charming residence designed for comfortable living in mind. The interior features include a fabulous kitchen with custom countertops and open to the spacious living area with an inviting wood stove. The outdoor space is complete with a covered deck for entertaining, is situated on over half an acre lot on a cul-de-sac and convenience to restaurants and shopping." "Nice home in Waterwood subdivision near Elmendorf. 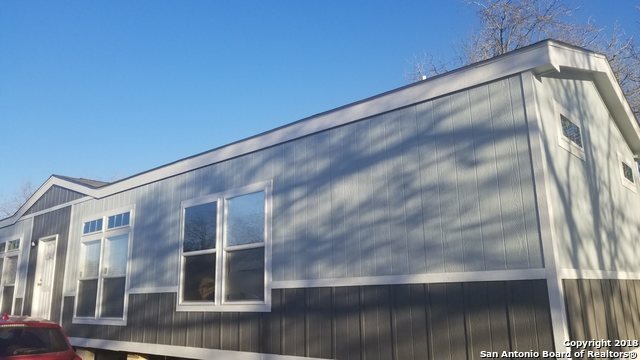 This single wide mobile home is only five years old, has a great floor plan, and sits on a beautiful lot (.49 acre) w/many mature trees and easy access to highway. There is a 12' x 16' barn style shed in fenced backyard, plenty of room for both storage and hobby room! Close to restaurants, stores and City Park. Mobile Home is a Solitaire SW-R380s." 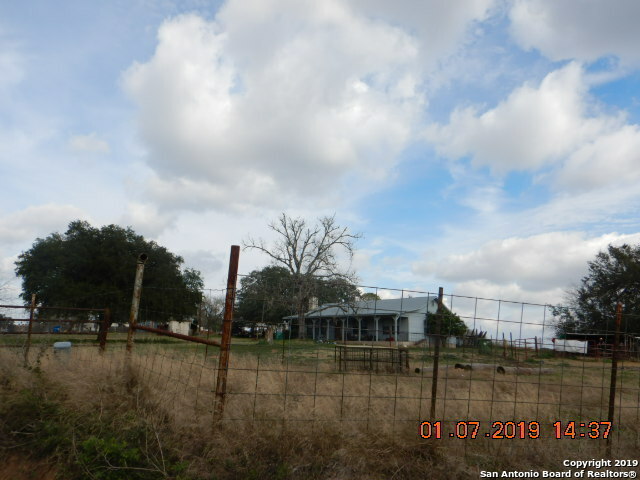 "COUNTRY LIVING - NICE 1 ACRE LAND WITH FEW TREES LOCATED ON THE OUTSKIRTS OF 1604 AND HWY37 SOUTH. 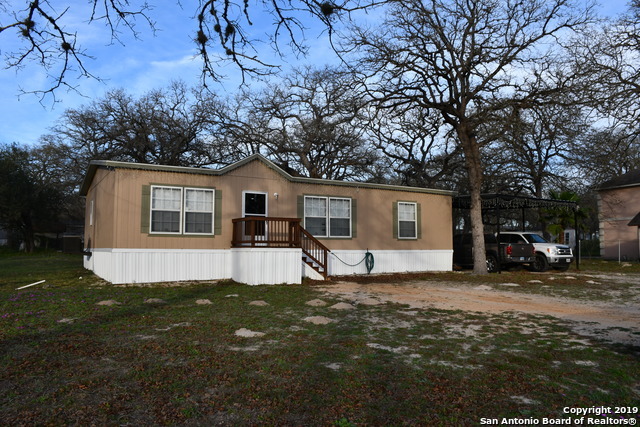 Manufactured home included"
"Charming 2 Bedroom 2 Bath home on 0.43 acres. Close enough to the city for convenient access to shopping and entertainment yet far enough away for peace and quiet. Great home for a small family with room to grow. Storage sheds and kitchen appliances convey. Won't last long so check it out now!" "A great price for a home in this area. Open floor plan. Just right off IH 37. Sitting on a nice lot. Established neighborhood." "Charming residence located in a desirable area. The interior features an open floor plan with high ceilings, versatile living area, inviting breakfast area and spacious bedrooms. This home is complete with a covered porch, mature trees and is fully fenced. Home is in need of some TLC."